World-renowned Italian tyre manufacturer Pirelli, recently held its annual dealer get-together at the Toyota Plaza in Wattala. Toyota Lanka is the authorized supplier and distributor of original Pirelli tyres in Sri Lanka and have been in partnership with the global giant for many years. 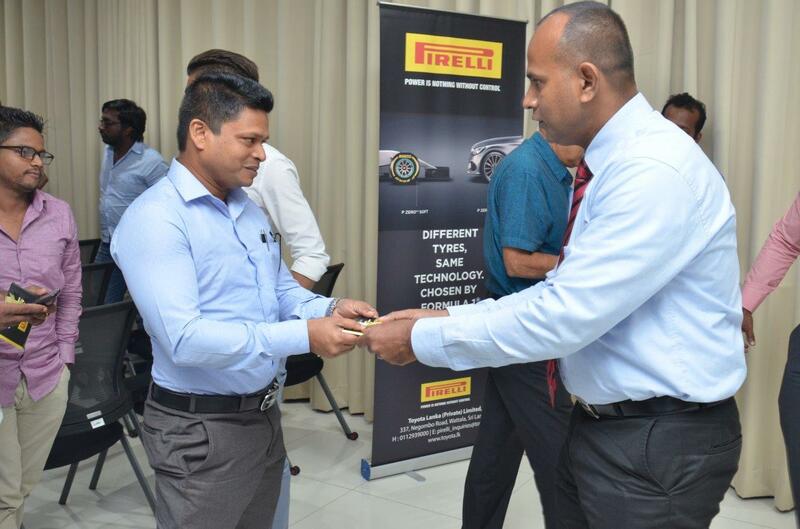 During the networking session a special manual on tyre maintenance, Pirelli’s safety and warranty claim policy, and a wealth of other information was shared for the first time in Sri Lanka. The booklet includes correct Pirelli tyre maintenance methods, technical advice on Pirelli tyres and the Pirelli tyre warranty conditions and claim procedure. Meanwhile, the winners of the all-expense paid Milan tour for Pirelli dealers in Sri Lanka were also announced. Sakura Tyre Center, Sandagiri Battery Work, Accmart Motors (PVT) LTD, Olympic Tyre House (PVT) LTD, U & H Wheel Service (PVT) Limited., NRS Auto Centre. Pirelli hosts outstanding dealers to annual tours at its birth country Italy and will also be extending tours to Japan and Thailand next year. Founded in 1872, Pirelli possess more than a century of experience in driving the global transportation sector forward. The company’s driving force has been its innovation which has also kept it far above competition. The premium tyre has global presence in 160 countries spanning all 5 continents. Apart from being the sponsor of the famous football club Inter Milan, Pirelli is also the official tyre supplier for Formula 1. Toyota Lanka has been marketing Pirelli tyres in Sri Lanka since 2011 and has a product portfolio that has been used as the original fitment tyre by the most prestigious car manufacturers in the world- guaranteeing high levels of safety and performance in different weather conditions. Pirelli’s P Zero tyre is custom built for superior driving pleasure, maximum safety in dry and wet conditions together with great traction and driving comfort, which makes it ideal for the sports class vehicles. The Cinturato P7 on the other hand is an all season tyre for any type of vehicle with a make-up that reduces braking distance and rolling resistance, making it one of the safest tyres on the market. Cinturato P1 Verde and the all-season Scorpion Verde are both designed with the urban driver in mind with the former featuring distinctive tread patterns that gives increased comfort and improved mileage, while the latter provides higher mileage without giving up comfort and safely on all road surfaces and in every condition. Last but not least the all-terrain Scorpion ATR is for the adrenaline junkie that loves the outdoors. Its tenacious and reliable build is great for off-roading while it is also versatile on regular roads providing comfort, excellent traction and resistance to wear. For more information on the Pirelli tyre range at Toyota Lanka please call 0112 939000 (ext-425 & 427) or visit the Toyota Plaza in Wattala or Toyota showrooms islandwide.